If you have a car that has a transmission problem, one of the things that you should know is that you should take it to a transmission specialist and not just any mechanic. If you have an excellent auto mechanic, we congratulate you–not everyone can even say that much. However, just because your auto mechanic is good at everything to do with cars, and can even work on transmissions, it doesn’t mean that they should do your transmission repair. Here’s an analogy: When you go to the doctor for your yearly physical exam, the doctor who sees you is a general practice physician. Hopefully you trust this doctor, have good rapport with them, and have had great results to your health through seeing them. However, one day, your doctor breaks to you some bad news. You have some concerning symptoms that indicate a deeper problem with your heart, your brain, your liver, your knee, or any other intricate body organ or system. What does your doctor tell you in that moment? The fact is, the specialist is called a specialist because they have specialized knowledge about that one system that goes much deeper than the general practitioner will ever have. The same is true with your vehicle, though we’d never go as far as to say that your transmission is as complex as your heart or your lungs. Your transmission is a complex mechanical system that is vital for the long life and functionality of your automobile. Yes, it can be expensive to repair, but that’s because it is such an intricate system that it is very labor intensive to repair it if something breaks. 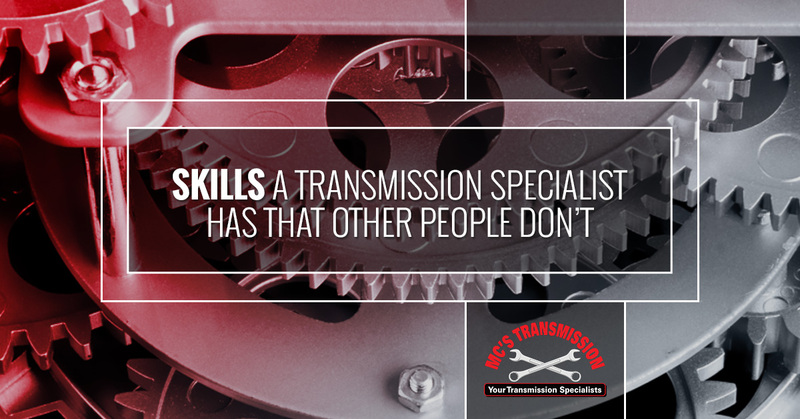 A transmission specialist is someone who has the skills and knowledge to diagnose, repair, and service your transmission in the most efficient manner possible. But just what are the skills that they have that other people don’t? Here are a few of them. 1. A transmission specialist can diagnose problems faster and more accurately. Because a transmission specialist has seen all kinds of transmission problems, you’ll spend less time in guesswork and in pursuing dead-end solutions. When you need your vehicle to get back up and running, you need someone working on it who is not going to waste time. 2. A transmission specialist will put your transmission back together in better working order. There’s nothing worse than paying tons of money to someone to fix your transmission, only to have it bucking like a bronco every time it shifts. While an older transmission might not ever be able to get back to the way it was when it was brand new, it should be able to get close. Proper transmission repair should result in a smooth shifting vehicle that is reliable for a long time to come. For a transmission specialist in Northville, bring your vehicle in to MC’s Transmission. We look forward to serving you!